James Uqualla is a member of the Havasupi Tribe (people of the blue-green waters). He brings the voice of the Havisupi Spiritual tribe. He is an Ambassador and Cultural Guardian. 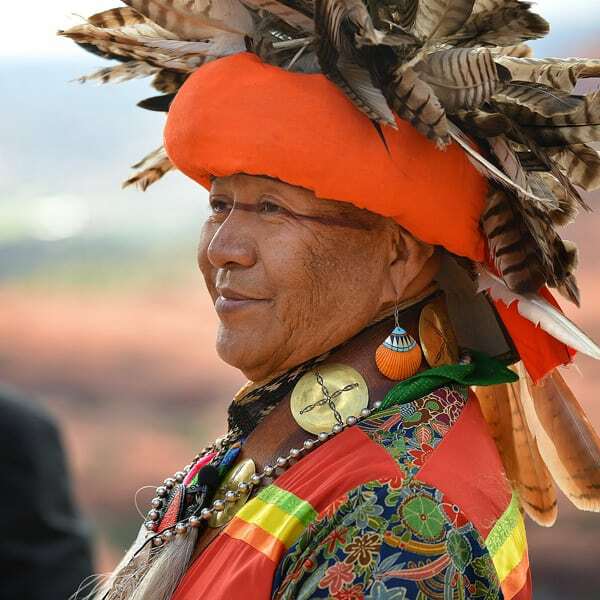 From the Heart of the Grand Canyon, the Havasupai Tribe live in the most beautiful and remote areas of the western Grand Canyon. Supai village is located in Havasu Canyon, which is accessible only by foot, horseback, or helicopter. Eons of ancestors have brought wisdom and teachings still relevant for the present times and people. Uqualla was born into a family with a Medicine Man Grandfather, Arthur Kaska. His mother, the daughter of Kioska, was given the knowledge of the traditional ways—hunts, deer tanning, gourd making, singing and dances, she passed these gifts to her children. The ancestral ways have provided the themes for many speaking engagements. All of life’s events are the reflection of the world’s people at large. They key is to interpret the meanings appropriate to the times and ages. The ethereal art of Coyote Telling is ages old and performed in tribal settings of canyon, cave, mountain and desert. Ceremonial Theater is the medium of expression. As a recognized ceremonial entity, spiritual advisor, Uqualla is called to officiate unions, birth, blessings and healings. Tools of the spirits, eagle feathers, bones, medicine plants, drums, gourds, fire, water, assist in the needed healings, awakenings and transformations. Some call him a medicine man, sage, storyteller, wisdom keeper and priest.